The Opteron 6200 series, based on AMD&#8217;s Bulldozer-architecture, is being touted by the firm as the "world&#8217;s first" 16-core x86 CPU, with up to 3.3 GHz base frequency, while its 8-core Opteron 4200 series offers a significantly lower power-per-core than its predecessors. The Opteron 6200 is said to increase server performance by up to 84 percent, while requiring only half the power-per-core and two-thirds less floor space. The series also offers up to 73 percent more memory bandwidth for increased scalability in a virtual environment, AMD said. 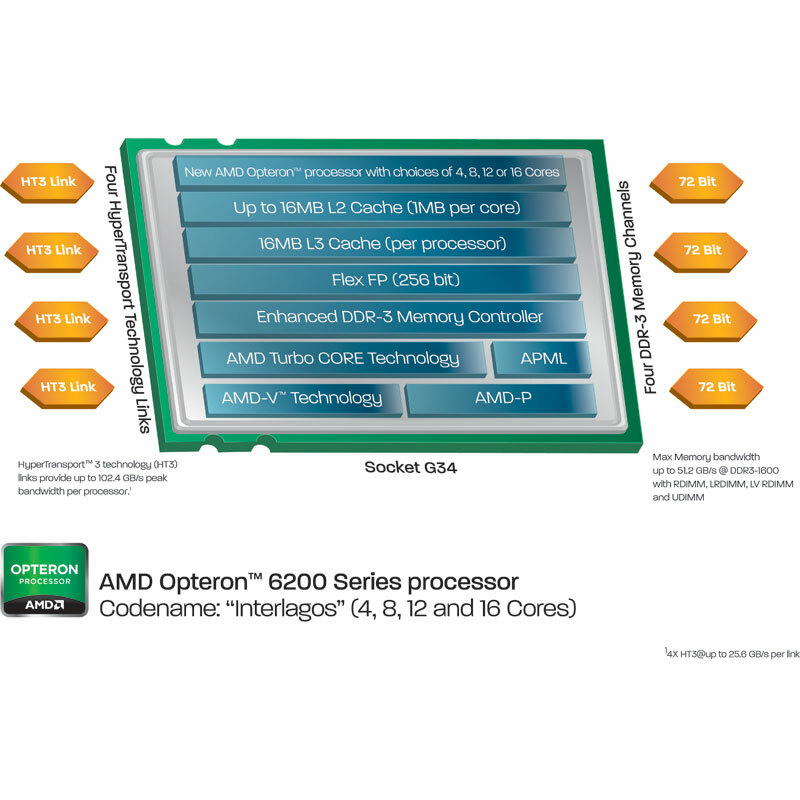 Opteron 6200 CPUs were designed to meet the demands of various server workloads, ranging from virtualization and cloud computing to database management and high-performance computing. Paul Struhsaker, corporate vice president and general manager of AMD's Commercial Division, said the new Opteron chips are ideal for cloud computing and virtualization because of their scalability. Virtualization software giant VMWare has affirmed the new processors&#8217; significance within virtualized environments. "We have been working with AMD for several years to ensure 'Day 0' support of the AMD Opteron 6200 Series processor," Richard A. Brunner, chief platform architect in the CTO office at VMware wrote in a blog. "You&#8217;ll notice that both VMware vSphere 5.0 and vSphere 4.1 Update 2 can already leverage the full scalability of the new 16-core AMD Opteron 6200 Series processor in a 4-socket server platform. And as an added bonus, vSphere 5.0 also stops licensing by core count. We also worked closely with AMD&#8217;s server OEMs to successfully qualify and certify their new AMD Opteron processor-based servers by launch time," Brunner wrote. Apart from performance and increased scalability within virtualized landscapes, power efficiency is perhaps the most unique feature introduced with Opteron 6200 processors. The CPUs' new TDP Power Cap functionality, for instance, allows data centers to monitor and control power consumption at a granular level. By customizing TDP caps by one-watt increments, data centers can maximize server density and tap into previously unused space. "The TDP Power Cap is big for cloud providers because it gives companies granular control of their power envelopes," said John Fruehe, director of product marketing at AMD. In an effort to accelerate the new processors' time-to-market, AMD announced last week its Ready Solution for server program, a collaborative effort between server platform manufacturers including Asus, Supermicro, and Tyan, to deliver ready-to-market Opteron 6200 processor-based motherboards. The verified server platforms are available now through AMD authorized resellers. AMD believes that the Ready Solution for server platform, along with the processors&#8217; influence in the virtualization and cloud space, will facilitate channel partners&#8217; growth within new markets. "The new AMD Opteron 6200 and 4200 Series processors deliver the optimal balance of performance, power-efficiency and price to meet the growing demands of the ever-increasing cloud-ready world," said David Kenyon, corporate vice president, worldwide channel marketing at AMD. "Our partner ecosystem will benefit from expanded business opportunities in combination with infrastructure-ready solutions available at launch and an easy upgrade path."